Isn’t she grand? She’s on offer elsewhere; I came across her while narrwing down a date for a very different portrait. She reminds me of a Tamara de Lempicka, if Tamara and Ammi Phillips had set up easels next to each other. 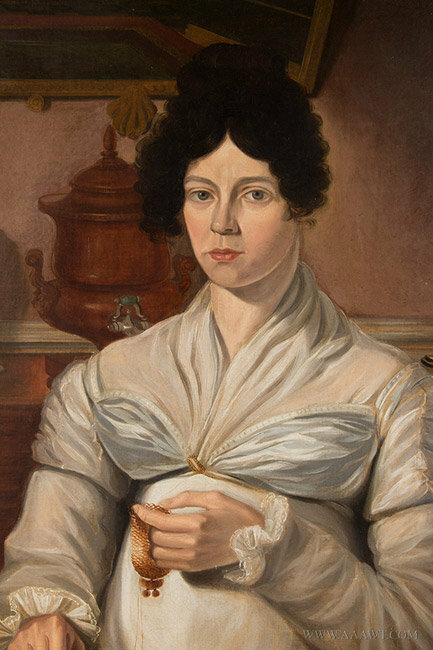 From her forthright, slightly sulky gaze to the exuberant folds of her gown bodice to the hints of style in the details, we can learn a lot from this painting. There’s a kind of provincial Hepplewhite sideboard behind her, set with a colorful garniture; the copper hot water or tea urn places us in a parlor. The painting frame has a shell in the center of the bottom rail, the chair a turned knob on the back upright– we are on the edge of fancy, the moment when neoclassicism really gives way to exuberance (think canary yellow rose-painted china, big puffy sleeves on printed gowns, and fancy-painted chairs). Below, an earlier entry in the black and white world. This lady was sold at auction recently. She’s earlier than our near-Tamara above, plainer in dress, sulkier. 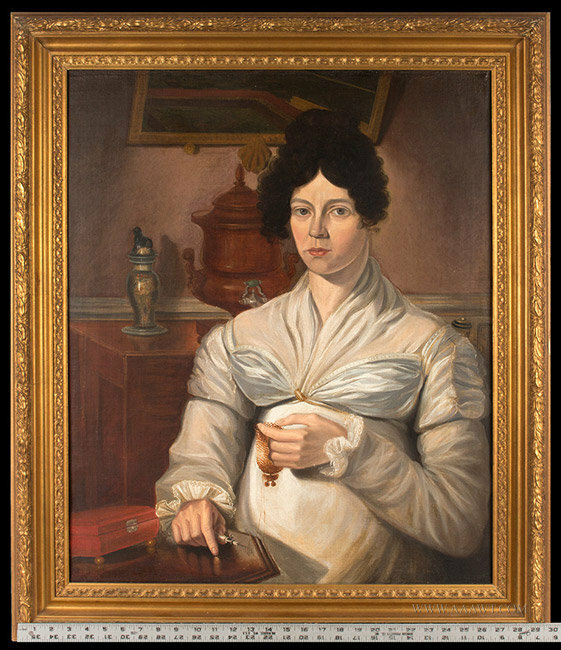 She is certainly more academic, and somewhat better painted, in addition to being set in a vaguely classic scene, in a very neoclassical chair, draped with a fine shawl.The artists is definitely showing off some skill in the “painting transparency” department. 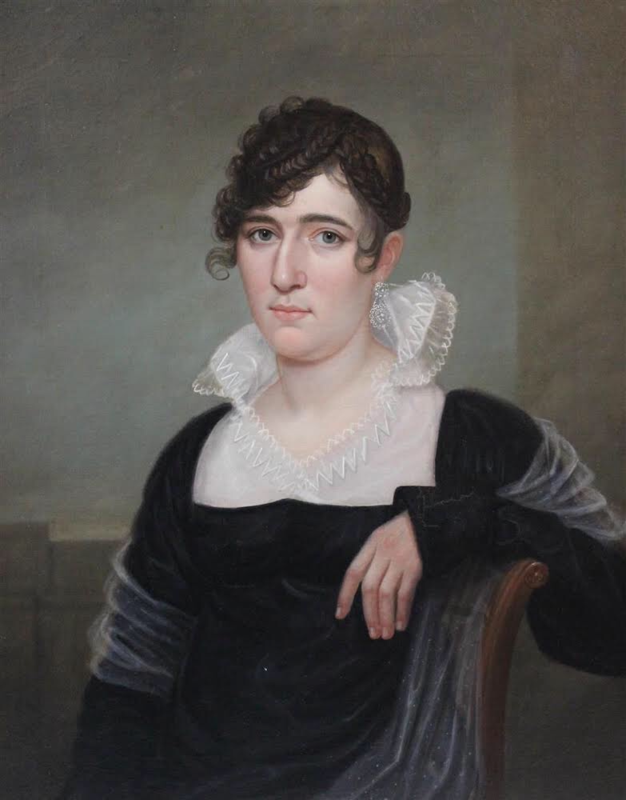 The lady in black is firmly set in the neoclassical period. Restraint and moderation are watchwords– despite what you may think of that hair, which is recalling Greco-Roman precedents–much the way certain factions in the Revolutionary period were driven by piety and discipline. Politics and national ethos or mood are embedded visual culture then as now, and even in these portraits, simple as they seem.